12 3/4 total diameter side to side. 9.5 center plate diameter - 4.5 tall. 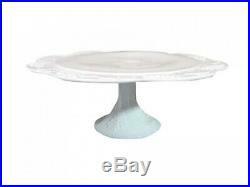 VINTAGE MILK GLASS PEDESTAL CAKE PLATE GRAPE & VINE. Pedestal cake plate, white milk. Raised grape and leaf design. Maker, age, or origin, unknown. 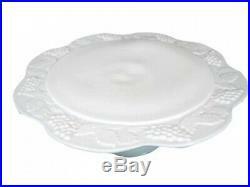 The item "VINTAGE MILK GLASS PEDESTAL CAKE PLATE RAISED GRAPE & VINE Scalloped edge" is in sale since Friday, March 15, 2019. This item is in the category "Pottery & Glass\Glass\Glassware\Opaque\Milk-White". The seller is "lorrainescollectibles" and is located in Howell, New Jersey.